Progress continues to be made on the exterior of the house, and it has been so fun to watch! The side of the studio has new siding, so it’s completely finished now. And for the first time in months, the front of the breakfast room has siding. It has been covered with nothing but Tyvek since last fall, so this was very exciting. Obviously, I decided against adding stone to the front of the breakfast room. It would have cost between $1500 and $1800, which I actually thought was a very good price for removing a whole stone wall and relocating it, and also included the concrete footing required for the new stone wall. But in the end, I just could’t bring myself to pay that much just to try to make something work that I didn’t like in the first place. That seemed like a silly waste of money. This was a really strange area originally. The side of the garage and the front of the breakfast room were covered in vinyl siding. But the side of the living room was stone (yes, it’s real) on half of it, and then vinyl siding above. 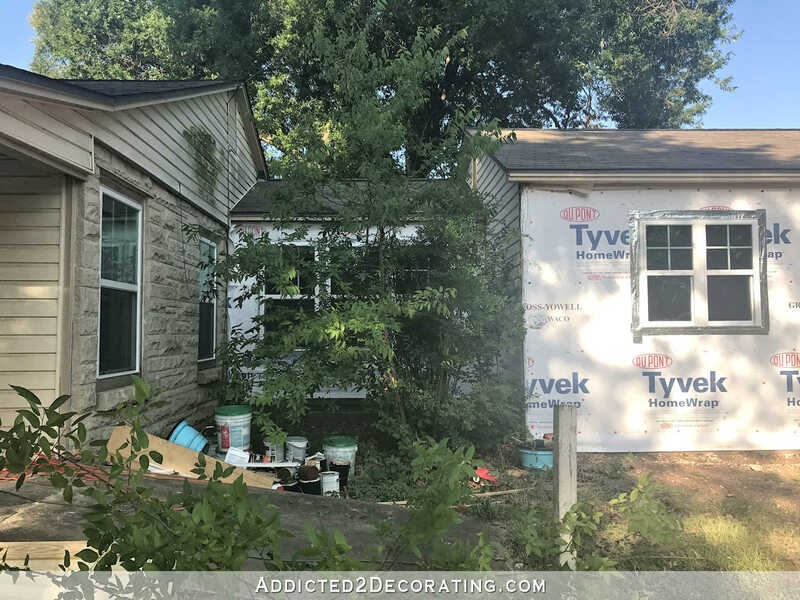 It was a complete mess, from the overgrown bush, exposed Tyvek, mildew on the siding, and my paint can graveyard that I was hiding in the overgrowth. So this area has greatly improved (but I still need to take my half-filled paint cans to the recycle center). Yep, I had them remove the stone on this wall. No matter how I tried to make it work in my mind, I just couldn’t. The initial siding job that I had them give me a quote for included siding the studio and the breakfast room/pantry (front and back of the house), and stopping right there at the stone wall. But the more I thought about it, the more ridiculous that seemed to me. 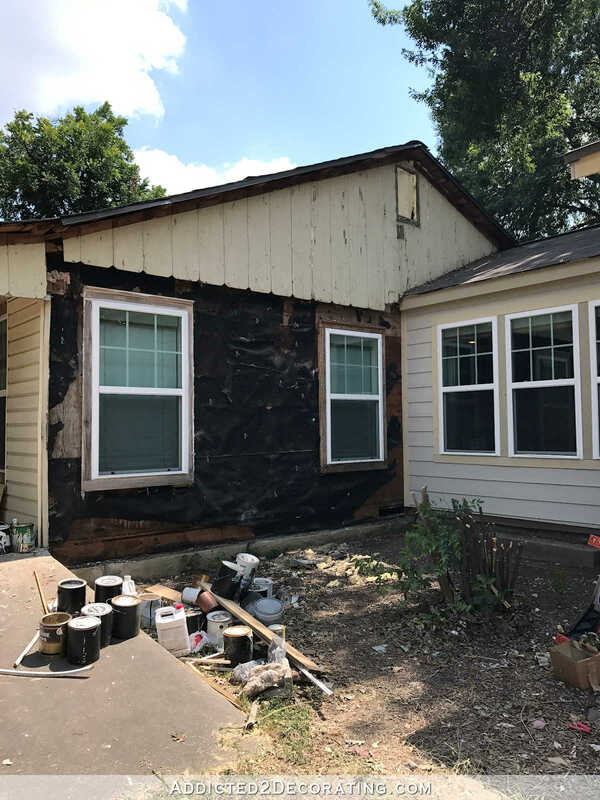 I knew that I wanted that stone gone, and it didn’t make sense to have them do siding right up to the stone only to come back at a later date and remove the stone, which would require removing and redoing a great deal of the new siding on the front of the breakfast room. So I decided to go ahead and have it done now. 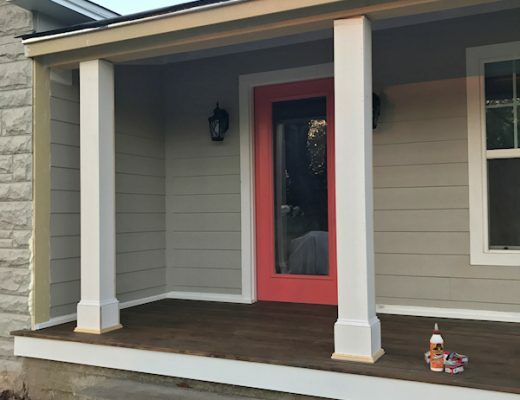 And while they’re at it, they’re also going to do new siding on the front porch and close up that awkward second side door on the front porch (the one that’s just right there to the left of the front door). So basically in a few days, there will be no more vinyl siding on the front or sides of my house. 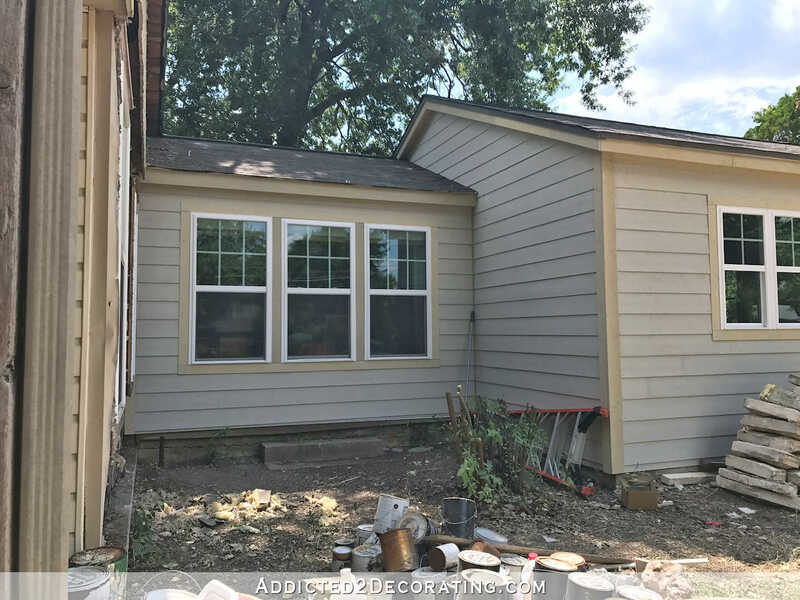 All of the vinyl siding left will be on the back of the house, and it’s on areas that will be torn down when we do our addition. But this crazy stone/siding hybrid wall has definitely been a headache for the guys installing the siding. Fortunately, they’re the same guys who framed the studio, so I feel confident that they can figure out a solution to these issues, but here’s what we’re looking at. Those two issues — the windows sticking out and the concrete footer — would be no big deal if the entire wall had been stone. 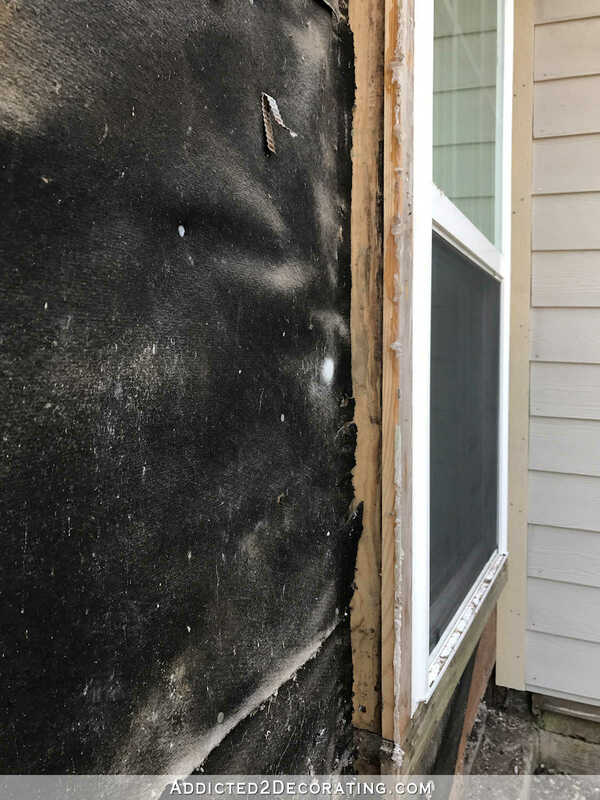 They could just furr out the wall with lumber to bring it out to the windows and concrete ledge, and then proceed as usual — OSB, Tyvek, siding and trim. 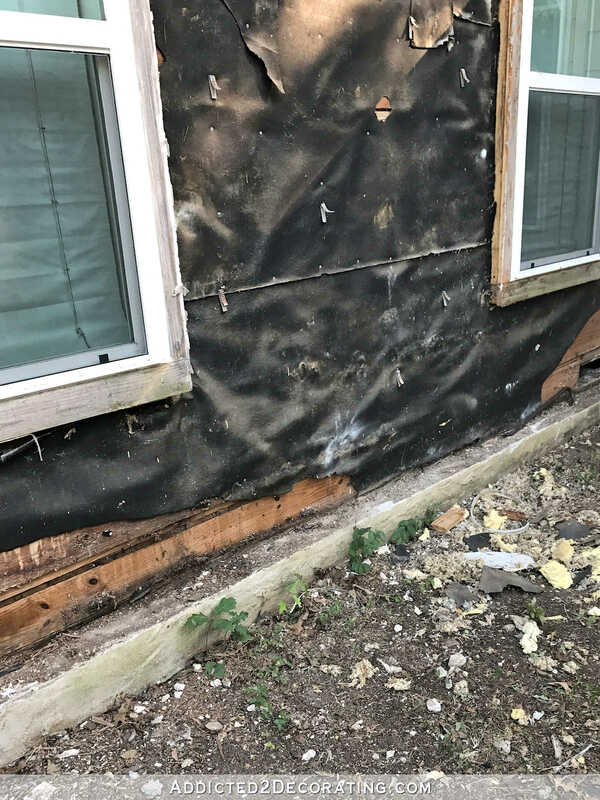 But this wall threw them another curve ball because the upper part of the wall was built so that the original wood siding came out just enough to overlap the top of the stone. You can see here that it sticks out just a bit further than the windows. 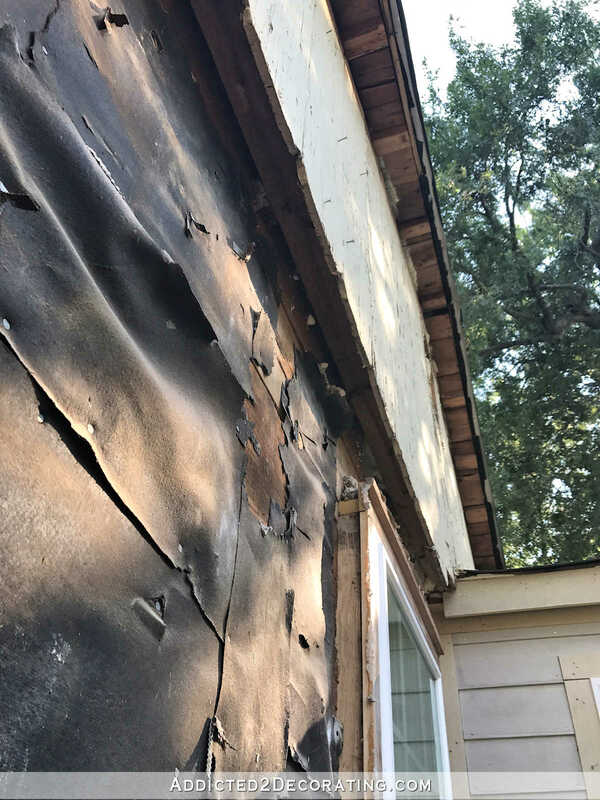 And yet another issue is that that original siding at the top can’t be taken off because it’s completely covered with the spray foam insulation in the attic. If those siding boards are removed, I’ll lose my attic insulation on that entire gable wall. So it has to stay, and they’ll just put new OSB and new siding right over it. So I have no idea how they’re going to deal with this wall, but I know for sure it’s not going to be a completely flat wall. I’ll still end up with the top part jutting out just a bit over the bottom half of the wall, but I’m still convinced that removing the stone was the right decision. I don’t regret it at all, and I trust them to make it look good. If this were a clearly visible front wall of my house, I might not be so easygoing about it. But since it’s a side wall that’s tucked in there a bit and not clearly visible from the street, I’m not going to worry about it too much. I’m just so darn excited about the fact that my house will very soon be completely rid of vinyl siding on the front and sides!! And while we can’t do the front porch extension/double gable addition right now, I think just getting new siding and closing up that awkward side door will be a huge improvement. Now I just need to figure out the paint colors! Hey, congratulations! I think you are so smart to do this all at the same time, especially since you trust the work of these guys. Who knows if they would still be available down the road. That’s too bad about the spray on insulation being lost if you took down the siding at the top. Once it is all prepped and painted it will look good, I think. Good luck choosing the paint color – that’s such a daunting task to me. Maybe they can add furring strips and fill with a layer of styrofoam insulation to make up the difference. Win, win! Our house is covered has a layer of styrofoam insulation under our siding and our utility bills are soooo much cheaper than our neighbors. Worth it if you have the space anyways. Great! Makes a HUGE difference! 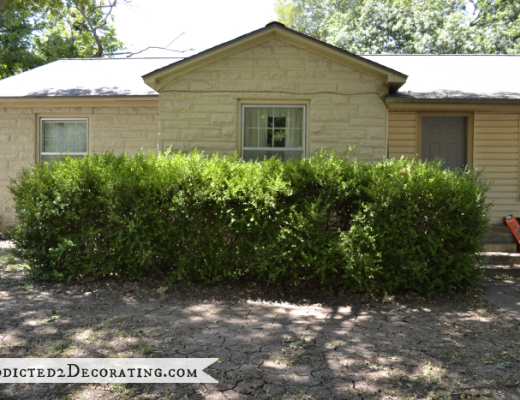 My husband and I are making substantial changes to our house, too. Like you, I have an eye for symmetry. Here’s a suggestion. On your main house end wall, what about bringing down the height of the framed gable with a horizontal band to match the band your have at the breakfast room roof line. That would require very little framing but would tie the two together nicely. Also, it would disguise the “step”. Then everything could be sided horizontally to match the breakfast room. That attic gable can be removed with the foam insulation if there is another access to that loft area. The new siding can simply be re-sprayed with foam again. That seems the simplest and cheapest method to me. Think of all the additional light with that weed/plant removed. How exciting! A McGuyvered solution to me would take down that siding with the spray foam. Do the suggestion above for new styrofoam sheets and furring strips to make the wall match the window depth all the way up. To complete the seal again you can use the canned insulation foam that’s used to insulate around new ext. doors and windows to fill gaps on the attic side between the sheet foam and “re-seal” the attic. Research to make sure all the sprayfoams and foam sheets won’t react with each other. It is looking fabulous! I love that siding and wish we could put it on our house. How exciting! It’s going to look like a new house!! But with the charm and character of an older home. Maybe the contractor can do a vertical board and batton look on the top part of the side wall. It would fit the craftsman-ish style but with a bit of uncluttered modern aesthetic. What about putting some of those faux cedar shakes at the top where it juts out? Maybe something like this? The come in an assortment of colors. Unbelievable how great the breakfast room and studio look now with the new siding and that scraggly bush removed. Looking forward to seeing the other siding installed too! I hope sme magazine is following this and does a big fancy schmancy spread on you! I have nothing useful to add, but it’s interesting to read your thoughts and the thoughts of everyone else. It must be nice to feel so confident about your contractor. Keep up the good work! It’s all so nice so far! Super exciting times with all the new siding…….and how awesome does the exterior of the studio and breakfast look now! It is even a huge difference with that big bush gone from the front of your breakfast room. Exciting times for you and Matt and so happy for you that so much is coming together on your home now. Super exciting! Such a good idea to go ahead and address that funky living room wall now. Like you, I would hate to install siding now, just to have to remove it later to take out the stone. What will you do with the stones? I like the idea of putting some sort of garden wall or something in front of the breakfast room & studio to add stone to that side of the house and balance it all out. Or, are you thinking about eliminating stone from the front of your house entirely and maybe using it for hardscape in your back yard at some point. Maybe the cost of getting this wall redone will help you think about your options re: removing the stone entirely on the guest bedroom and game room walls. Can’t wait to see the color! Good luck! I haven’t decided exactly what I want to do with the stone yet, but I’ll definitely be keeping it. 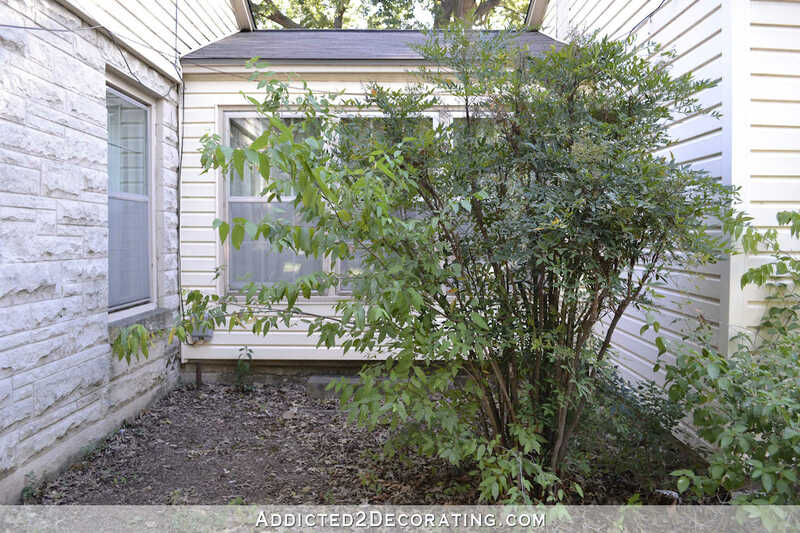 I’d like to see the house painted before I make any decisions on landscaping and such. Everything is coming together so nicely and looks beautiful. Can the guys add a styrofoam or plywood sheets to build up the depth difference? I’m not sure, but I’ll ask the about it. When you are thinking about the siding and stone wall, you might think about how you will landscape this area. Low bushes and flowers will hide a lot and beautify this area. If it’s not vinyl, what material is your siding made of? It’s HardiePlank siding — a fiber cement material. I completely agree with you that the stone wall had to go. It was definitely in an odd place, to begin with. But I like the idea of just siding the whole thing for now since it’s not super expensive. I also agree with the above comment that you could just frame the gable down to the height of the adjoining breakfast room to make the siding match all the way down. That way you don’t have off set siding lines running up the side of your house. Can’t wait to see what you have in store for the addition though! Just wondering how long the siding can go with out painting it. Are you doing it or hiring it out ? Can’t wait to see the siding with or out paint. It would be a good idea to power wash the porch & foundation before you paint. It can go years and years without being painted. I don’t think painting is necessary at all. 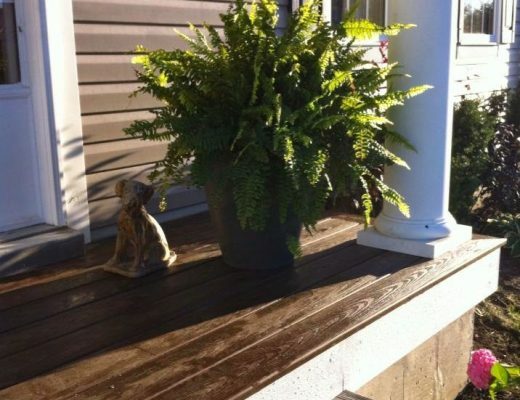 It’s fiber cement, not wood, so paint isn’t needed to seal it and protect it from weather. Right now, I plan to do it myself. But I’ve never painted a house before, so if I start and feel in over my head, I’ll see about hiring it out.